Stop Now! Under Door Weather Stripping is made of high quality silicone rubber, non-toxic, durable and flexible material. It forms a barrier against the outdoor air, as well as dust, pollen and insects, the noise and saves electric bill. You could install to where it would sit flush with the floor as to keep out insects and drafts. Three layer design, reduce sound mostly. 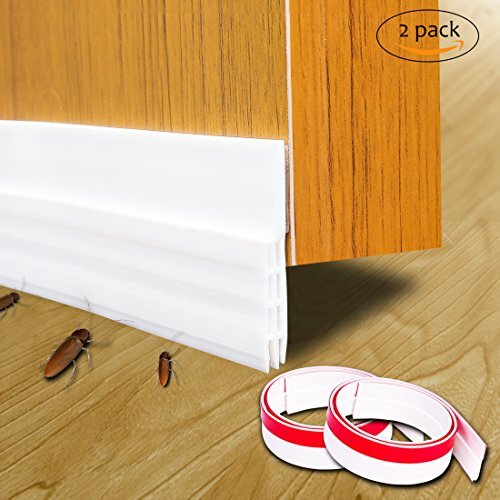 With this door draft seal, you will not suffer from the noise any more. There always some bugs climb through the crack under the door. With this door bottom seal, you will not worry about it any more. This door weather stripping will block the cold and hot air cross, help you reduce electric cost. Multi-Function Strip - Designed with three noise insulation cavity. Seals the door to reduce sound noise up to five times, blocks out drafts, air leaks, dust, pollen and insects in both cold and warm weather. Premium Quality Material - Environmentally friendly silicone, non-toxic, true material, homogeneity of color, the same interior and exterior, heat and cold resistant, best under door sweep for the door. Waterproof Backing - Made of thicken backing, strong adhesive, non-deguming, ensure this door gap blocker can be used in wet conditions, such as bathroom, washing room and etc. Soundproof & Airproof - With soundproofing holes and 3 layers, it could reduce sound up to 5 times. Block the cold and hot air cross, help you reduce electric and gas cost. Easy to Install - Fast and easy install within 2 minutes. It's strong enough to stay firmly in place, but can be removed without causing damage. If you have any questions about this product by UMLIFE, contact us by completing and submitting the form below. If you are looking for a specif part number, please include it with your message.